A young marmot settles down to sleep and dream through a long winter. 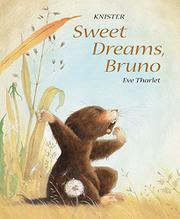 Bruno doesn’t really want to go to sleep, but the alternatives offered by his friends—climbing on the slippery rocks with goat, braving the cat to move into the farmhouse with mouse, flying to Africa with the swallows—all seem unfeasible. At last, with a grumbled “I guess everyone spends winter in their own way,” he crawls into his den. That’s when the action begins, as in his dreams he leaps between tall crags atop the goat (“Hooray!”), joins the mouse to hunt (with toy weapons) a tiny, frightened-looking cat (“Woo-hoo!”), and has other adventures until his friends’ voices wake him up for summer fun. Tharlet gives her animal cast animated human expressions and, sometimes, postures (Bruno’s abject discouragement is a particular treat) but otherwise draws them with delicate naturalism in idyllic seasonal settings.